Troika has 0 votes. Click here to see the results. If you're looking for a flavour of Mother Russia's glorious past then you needn't look much further than Tallinn's own Troika restaurant. 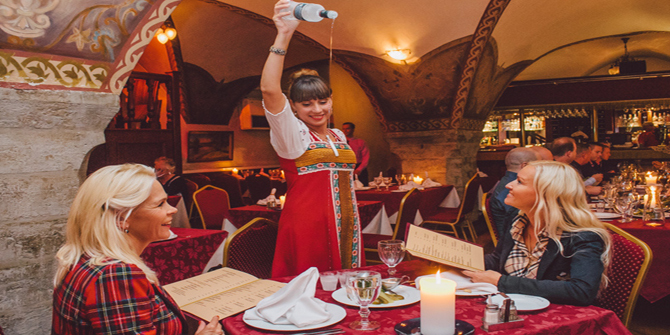 From its arched cellar ceilings and 19th century decor to the brightly-costumed staff, Troika abounds with Ruski romance - and none more so than when bayan and balalaika wielding musicians step into the fray! Pig out on classic dishes such as pelmeni, blini and stroganoff or why not go the whole hog (literally!) by ordering the Mannerheim feast. The Finnish military commander and statesman had a legendary appetite and amongst the many dishes laid on his table (and now yours) were lampreys on crushed ice and smoked-oven piglet, stuffed with buckwheat. I have been to lots of different places all around Tallinn but inside this one i do not want to get in.half of the staff does not speak russian what makes you hesitate if you are in russian place or not.one sunday evening was looking for a place where i can ave a dinner with my man.troika was near so we tried to get in.in the middle of the hall the waiter stopped us and said that they are going to close in 1 hour.after two minutes when we decided to have our meal there he was watching us for a while with unfriendly face and finally answered that everybody is gone...what was the point to give us a hope that we can still have dinner there? We had a wonderful evening! The food was first rate and the entertainment also good. Service was friendly and excellent. I shall definitely return! Simply the best strogonoff I have ever eaten, accompanied by a chilled vodka - what a brillant night never to be forgotten...I cannot wait to return. On the last night of a recent visit to Tallinn, my girlfriend and I had high hopes for a Russian restaurant called Troika especially when we entered the basement dining area through arched cloisters to find a Russian tenor serenading the guests on his guitar. However, despite the delightful surroundings, the food was disappointing. The waitress asked if we would like an appetizer, we agreed but were a bit confused about what we were getting because her English was poor. However she brought us some gherkins along with two shots of straight Vodka which mysteriously arrived at the table unordered. The Beef Stroganoff was swamped in a thick overly creamy sauce. Another beef dish was served with an array of picked vegetables with vinegar overpowering the taste of the meat. However the real surprise came at the end when the bill arrived and the vodka aperitifs were 10 euros a shot. When we queried it the waitress told us that we ordered it. I asked to see the manager at which point she got over another waitress who lied to us by saying she was the manager (authentic Russian secrecy the KGB would have been proud of!). She explained that adding unordered items to the bill was a Russian custom. To sum it up, Troika was a poor choise of restaurant for our final night in Tallinn and the sneaky, dishonest nature of the staff left a sour taste in the mouth. Add a widget for Troika to your website and get more reviews!